PHOTO CAPTION:The red and clear glass prisms and highly polished brass light fixture of the Umpqua River Lighthouse near Winchester Bay can be viewed during regular daily tours. Thanks to wild winter weather, a few favorite destinations took some hits. At Golden and Silver Falls State Park east of Coos Bay, an alder fell and took out the footbridge to the trails to Golden Falls. The park remains open, however, and the trail to Silver Falls is still accessible. According to Oregon State Parks district manager Larry Becker, the bridge was scheduled for replacement and "had been on borrowed time because one of the support beams had a spiral fracture." He said state parks officials are working with the Oregon Dept. of Fish and Wildlife to get permits and minimize fishery impact. They're hoping to replace the footbridge with an "assemble-on-site" bolted and self-supporting truss bridge similar to those in other state parks, but the work may not be finished until June, said Becker. Meanwhile, "we realize it's going to be an inconvenience if you have to wade the stream to see Golden Falls," he said. "It's unfortunate and obviously not what we wanted to do." Closer to the coast, Whale Watching Week is March 23 to 31, with gray whales headed north to their summer feeding grounds. Spot them from any coastal high point, or visit one of the 24 whale watching stations beginning on Saturday, with volunteers on hand with binoculars and spotting scopes from 10 a.m. to 1 p.m. every day. South Coast sites include Cape Perpetua, Sea Lion Caves, Umpqua Lighthouse, Shore Acres (south of Charleston in the Coos Bay area), Face Rock State Park (Bandon), Battle Rock Park (Port Orford), Cape Ferrelo overlook, Harris Beach in Brookings and 9th St. Beach in Crescent City. Migrating whales follow a fairly standard routine. Juveniles lead the way, followed by adults, with mothers and babies bringing up the rear. As for swimming and feeding, the pattern is to swim underwater for about 45 seconds, rise to spout and breathe, swim for 45 seconds, spout and breathe, then dive for 3 to 5 minutes. Spouts or blowholes are common, but a "breach" is the ultimate whale sighting, with the beast coming partially or completely out of the water. "Spyhopping" is the term given when a whale surfaces for a look around. Meantime, the smaller Orca or killer whales with their distinctive black and white coloring can be spotted all year round, and sometimes stay in one place for 20 to 30 minutes hunting, feeding or cavorting – truly an unforgettable spectacle. Every trip doesn't guarantee a whale sighting, but you can have an interesting time at the Umpqua Lighthouse and Museum near Winchester Bay (also a whale watching site). The museum's free and open 9 a.m.to 7 p.m. Lighthouse tours 9 a.m. to 6 p.m.; $3 for adults, $2 for youngsters. The museum in a vintage Coast Guard building has two floors of artifacts, photos and displays. 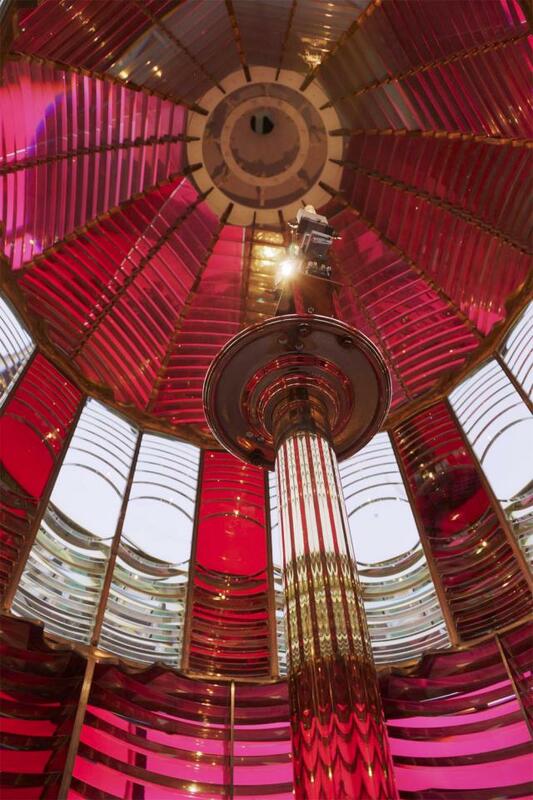 At the lighthouse, volunteers share statistics and stories as you climb a circular iron staircase into the base of the light, with its precisely-cut, jewel-like red and clear prisms that produce its distinctive "signature." As for the aforementioned guided hiking opportunity, the South Coast Striders hiking group will visit the trails at Bandon Dunes Golf Resort beginning at 10 a.m. this Sunday, March 24. It's free! Details at www.coostrails.com . This Saturday is the annual SOLVE beach cleanup, with 45 collection sites including Umpqua Beach in Winchester Bay, Bastendorff Beach near Charleston, Face Rock State Park in Bandon, Battle Rock Park in Port Orford, Ophir Rest Stop, and Harris Beach Rest Area in Brookings, where you can get collection bags and/or drop off your findings. Organizers say it's a way to "visit your favorite beach or discover a new one."